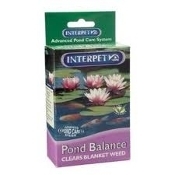 Pond Balance - Interpet - No more string algae ! String Algae is a problem that affects most ponds, the rapid growing filamentous stringy algae can spoil the appearance of the pond. It will also clog pumps and filtration equipment. fish, filtration bacteria or water using wildlife. and thus literally starves it out of existence. Pond Balance also contains plant stimulants and so helps establish a naturally balanced pond. milky white, this is harmless.